Reflections on the E-Leather stand. Latest edition of Fainsa’s Gala coach seat. Eberspächer Sütrak AC230 air conditioning unit with heat pump. The RoadPump coach toilet drop system from Vogelsang. Rollibox concept for coach from Schnierle Seating Systems. Brake discs and other products from Firstlink Auto. A hectic programme of press conferences and launches meant there was not time to catch up with many of the product and service suppliers that form an important part of Busworld. This review features a few that caught the eye, though there were many more including a further selection of UK companies such as Camira, A.T. Industries, Invertec and others. Grayson Thermal Systems showed the firm’s lightest ever E-Drive pack, along with a new, long life 24v electric water pump for use on hybrid and electric vehicles, planned for series production in 2016. With a lightweight frame and more efficient reduced depth cores, the E-Drive system comes in at 74kg, giving a saving of over 20kg as well as the unit’s environmental and noise reduction benefits. It also showcased its new battery thermal management system for full electric vehicles and its updated HVAC range, including a heat and AC front box, designed to offer improved maintenance and, thanks to a lightweight aluminum frame, considerable weight savings. It was the first Busworld for Fainsa under new owners Compin Group who acquired it in January 2015. Compin are looking at the design of all Fainsa products, updating the current models and developing the next generation from 2016 onwards. 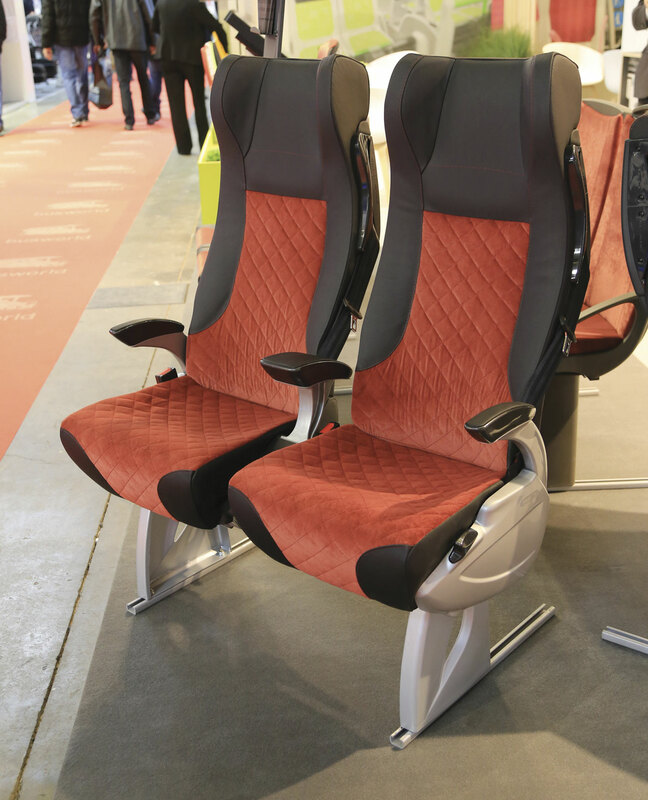 The latest version of the Gala and Stel seating ranges have new stitching and colours. Under the concept ‘give them a sofa’, the Gala is now available in soft patterned moquette with real leather headrests and back plus all age seat belts. A new bus seat is being developed with the UK market in focus. Compin brings experience from the rail market and offers products including a honeycomb floor that is one fifth the weight of conventional flooring materials. 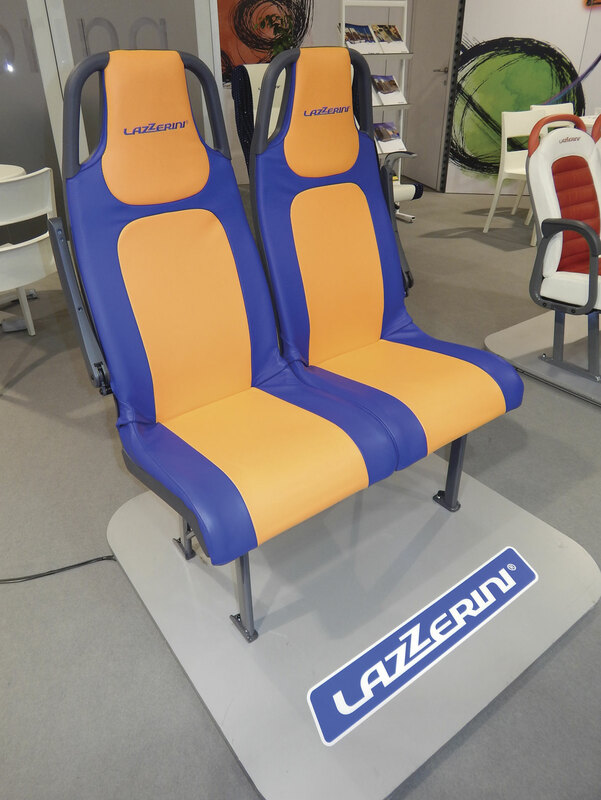 Under the theme ‘never stop exploring’, Lazarrini showed the production ready version of the no foam Ethos seat range developed principally for the UK bus market. Using special fabrics for safety and comfort, it has a number of handrail options and weighs 14kg for a twin seat with one pedestal. The company also showed options under development to improve the passenger experience, including a cantilever suction pad to which a phone or tablet can be attached to free up both hands and an LED reading light stalk. 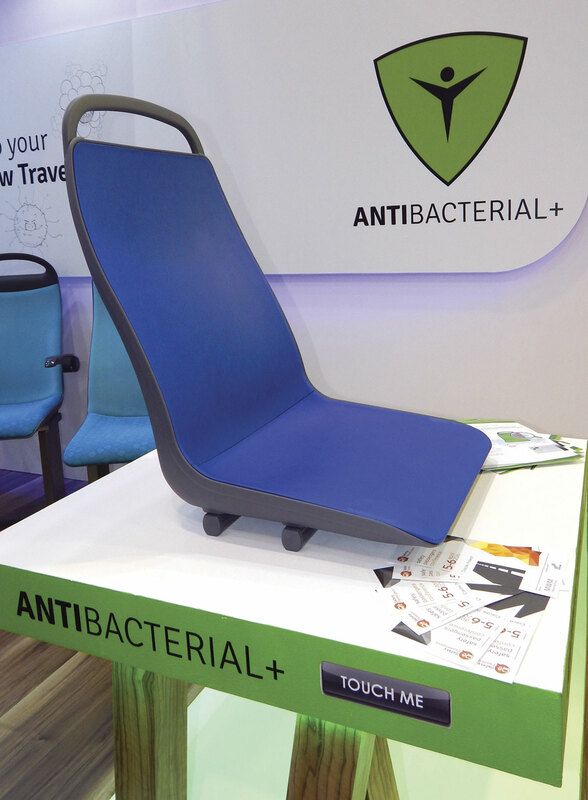 Alongside its growing range of lightweight seats, Ster launched their Antibacterial+ seat which is treated with silver nanoparticles to kill bacteria. A ten year life is claimed for the basic moulded seat. A fabric finish is also available, although the range of designs for the similarly treated material is currently limited. The first units are in production for Solaris vehicles. Rescroft represented the UK seating industry with a selection from the range of products seen two weeks earlier at Coach and Bus Live. 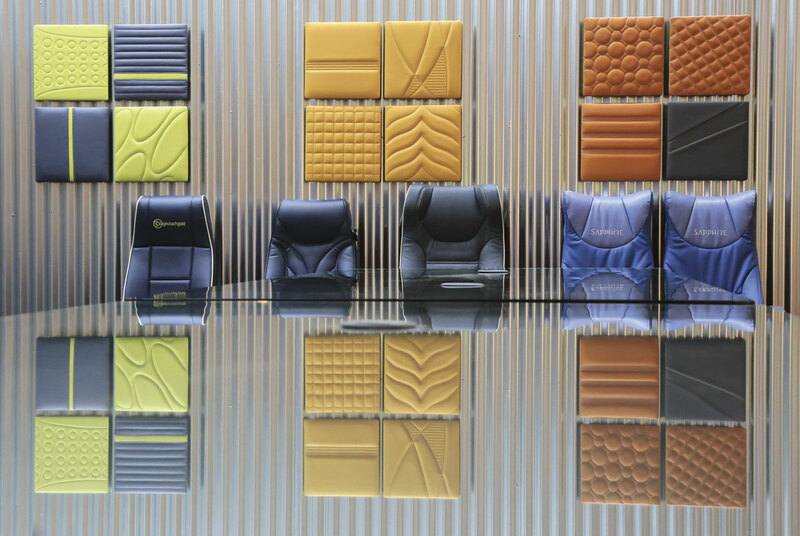 2015 marks the 70th anniversary of Franz Kiel GmbH, producers of the Kiel seating range. The celebrations included a newly designed stand for Busworld where a variety of new and further developed seat models were shown. In the bus sector, Kiel offers a new wooden seat pan, the Taxus. This is a third lighter than plastic seat pans, cheaper and benefits from the company recycling it at the end of its life. The basic module of the lightweight Citos moulded bus seat weighs only 3.9kg with fabric trim and foam, a range of optional fittings are available. For coaches, the Avance (E) features an in built vibration facility with a number of mood settings and can provide an extra dimension to the enjoyment of music on board. There was a feeling of opulence on the E-leather stand, with samples of the material showing the various stages of the production process, reflecting in a long, highly polished glass counter. Visitors were able to contrast the raw material with the completed product and view seats trimmed to the requirements of several major UK operators. 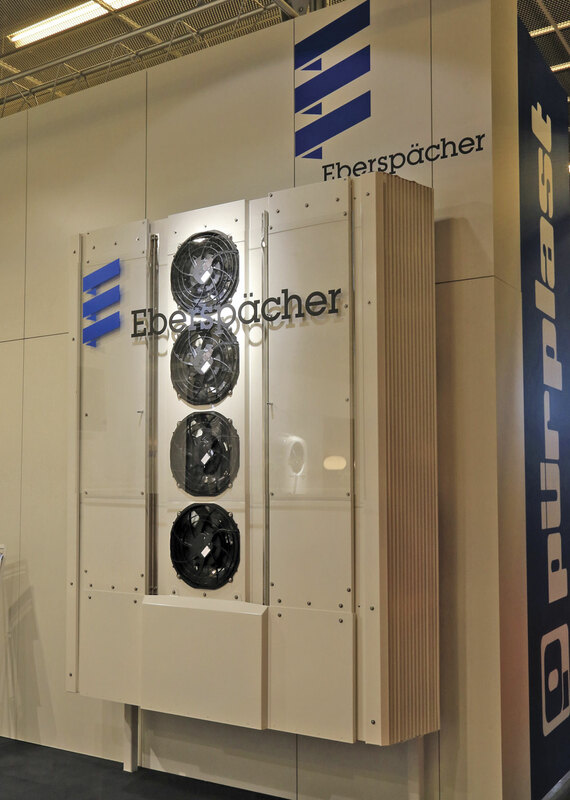 Making its debut at Busworld was Eberspacher Sutrak’s new AC 230 roof mounted system with integrated heat pump. This operates according to a classic refrigerant circuit but allows for the air flow to be reversed when heating is required. Redirecting the airflow significantly simplifies the connections for the heat pump and enables a seamless transition from cooling to heating. The company has applied to patent the design of the AC 230 which is a modular platform working with conventional refrigerants but capable of using CO2 in the future. The all electric unit is designed for maximum efficiency in hybrid, electric and trolleybuses. Additional heat exchangers can be installed for the battery tempering system and the recovery of residual heat from other sources. The company has also launched an updated modular control unit in its Klimalogic family. Thermo King launched their Athenia™ MkII Electric Heat Pump range which provides an efficient way of heating hybrid and electric buses using a reversible refrigeration circuit. In heating mode, it is able to transfer heat from outside air into the passenger area with a coefficient of performance (COP) level of up to four. This means that for each 1kW of electricity consumed from batteries, the heat pump generates up to 4kW of heating. When in cooling mode the unit operates as a normal Athenia MkII Electric air-conditioning unit. The heat pump unit’s battery cooling circuit works independently from the passenger compartment cooling and heating mode. It helps to effectively recycle the heating energy generated by batteries during bus operation and reduces energy consumption when passenger heating is required. Millbrook, the test, validation and engineering service provider showcased its extensive capabilities. These include comprehensive noise, exhaust emissions and fuel consumption testing of conventional and advanced technology hybrid, electric and hydrogen buses. It was one of the first shows for Millbrook since it acquired the world’s most northerly independent proving ground Test World, based in Ivalo, Northern Finland on 14 September. Test World has unique and versatile facilities, including specialist tyre testing capabilities and a range of winter tracks. A number of Finnish companies occupied adjacent stands promoting products designed for low temperature operation. Flex-EL from Taipale Automotive is a flexible floor heating system designed particularly to keep steps, ramps and door areas free of snow and ice. The stand was backed by a large image of a bus against a background of an icy street although the vehicle in the reversed image was a Transdev Blazefield Wright Eclipse! Hubner took a different approach to stand design, surrounding it almost fully with lightweight drapes and featuring a large tree like structure in the centre. Under the title ‘Grow with us’ the emphasis was on meeting customers and discussing how quickly they could help them. The company’s products, including a new lighter and faster operating, ‘plug and play’ wheelchair lift for coaches, were shown in model form. 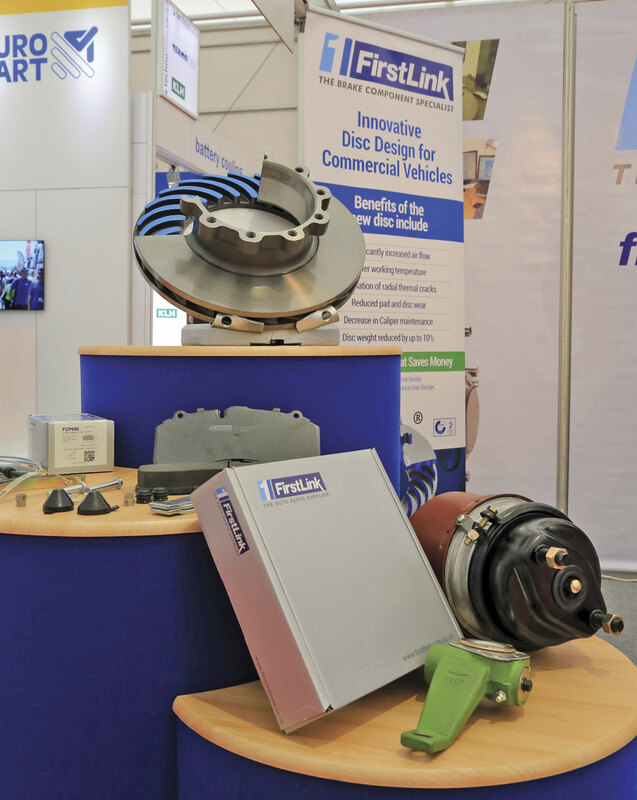 Sheffield based Firstlink Auto showed a range of aftermarket brake system components for all types of vehicle. Working with Sheffield University, the company has developed a patented replacement disc design with internal vanes, optimised for cooling the disc. The discs are produced in China although some assembly of other components takes place in the UK. One of many OEMs at Busworld, Greenford based Prestolite Electrical supplied the alternators and starter motors to be found in many of the vehicles at the show. Products are UK designed although sourced across the world. Hanging on the wall of the Heymann stand was an example of the company’s cycle racks for the rear of coaches. 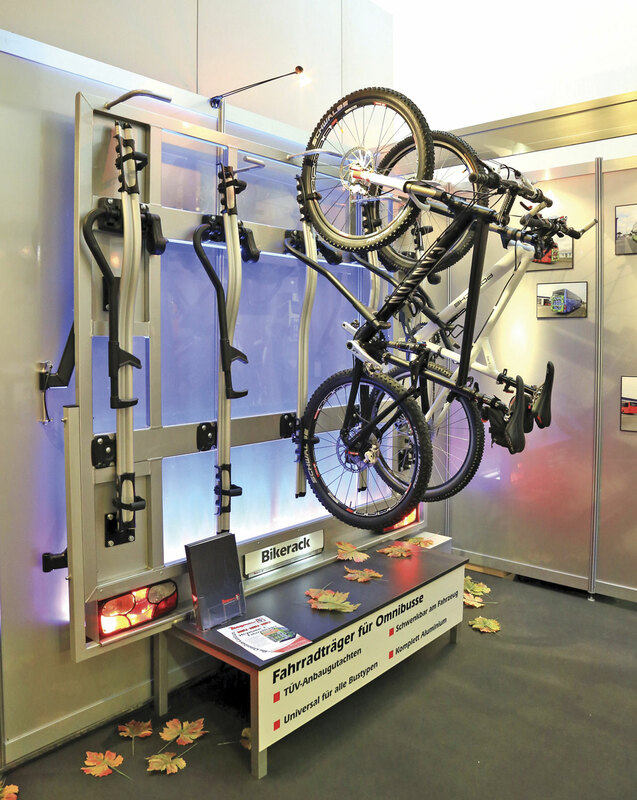 The light alloy rack securely accommodates five cycles and can be mounted to all current coach models equipped with anchor points for ski boxes. It is hinged to allow access to the engine compartment. Alcolock products from the Canadian ACS Corporation were shown by Alcolock France. 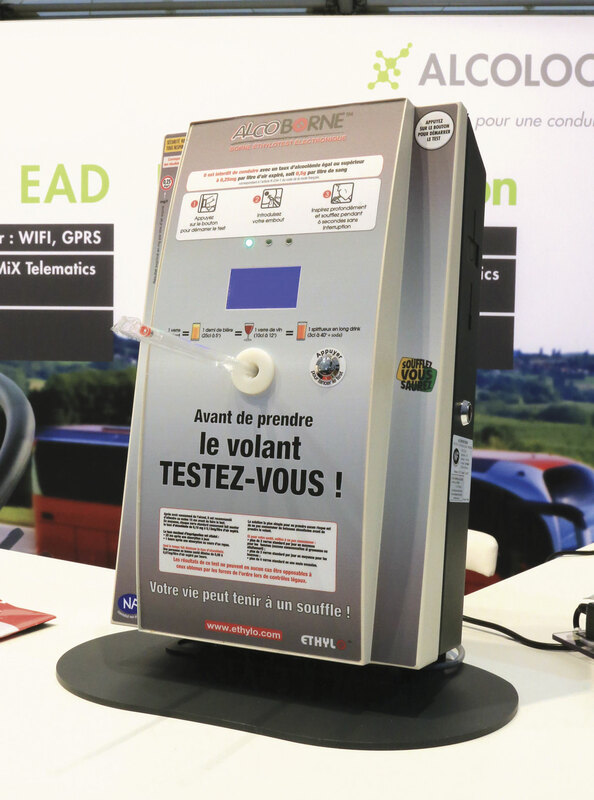 In addition to vehicle interlock testers, the company showed Alcoborne, a static tester designed for installation in depots and other places of work or entertainment. ACS Corporation products are distributed in the UK by Alcolock UK. 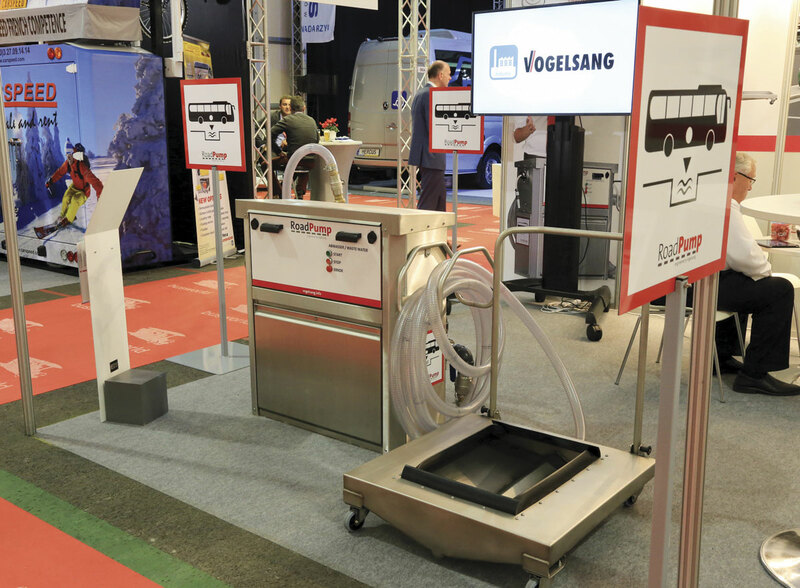 Bringing experience from the railway industry, Vogelsang showed their RoadPump mobile coach toilet disposal system developed in recognition of the growing intercity coach market. This consists of a tray for positioning under the coach and a pump system for disposal. The company’s background is in sewage and water pumps and it currently has a small rail orientated UK presence. Schnierle Seating Systems showed their range of solutions for adaptable and demountable seating. 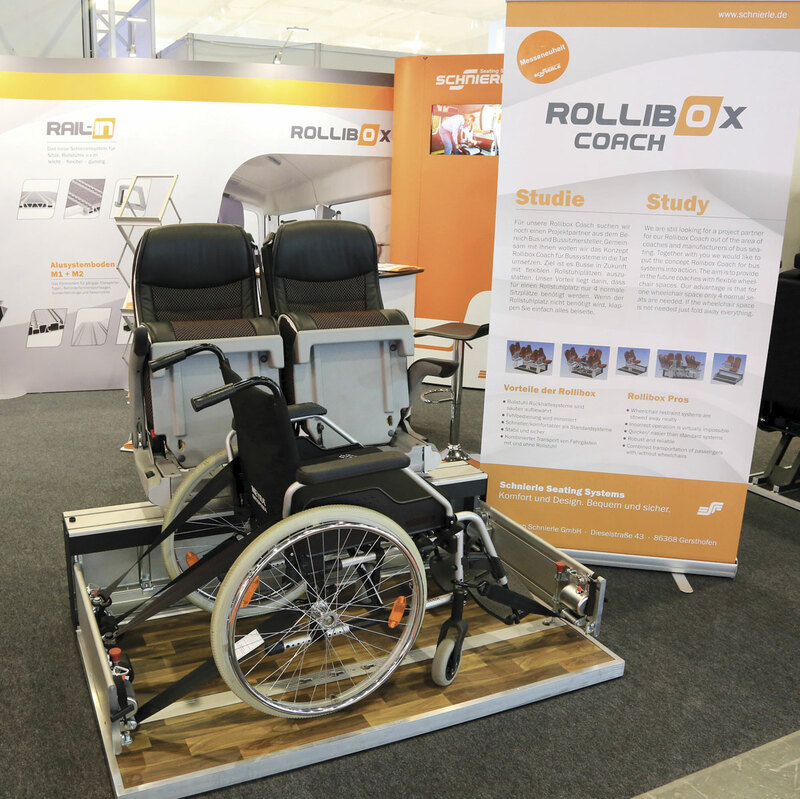 The company offers Rollibox, a seating and wheelchair restraint stowing system that provides for quick interchange between wheelchair and non wheelchair passengers. Wheelchair restraints are stowed tidily when not required, when in use the normal seat is folded and the wheelchair passenger faces forward using the seat headrest and three point seat belt. TUV tested, it is suitable for all common minibus base vehicles. The company advised that a UK demonstrator is being prepared by Alfred Bekker in Driffield, North Humberside. 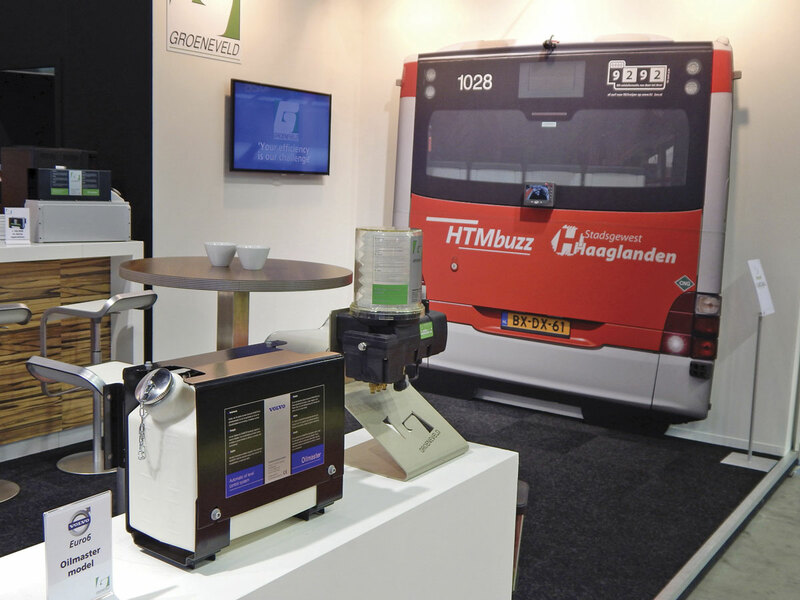 Groeneveld displayed their Oilmaster automatic engine oil top up system (note: not lubrication system as described in our Busworld preview). This avoids the need for manual oil level checks or topping-up engine oil and registers oil consumption in its electronic control unit, allowing for preventative maintenance. The company also produce automatic lubrication systems and Greensight, a safety system with ultrasonic object detection using Groeneveld’s CMOS camera system. Europart demonstrated its spare parts competence, spanning a range of brands, in particular for buses. The 770 page bus catalogue includes a comprehensive range of more than 5,000 articles suitable for all common urban buses and touring coaches from European manufacturers such as Fast, Heuliez, Iveco, MAN, Mercedes-Benz, Neoplan, Scania, Setra, Solaris, Temsa, Van Hool, VDL and Volvo. An extensive range of own-brand products offers customers looking for an alternative to original spares, a selected range of consumables and wearing parts. These are quality-tested in Germany and certified to the highest automotive standards.